This was the view from my window yesterday morning as I drank my coffee. This snowstorm was no surprise, I ran all my errands the day before meaning it was a snow day/ sew day! 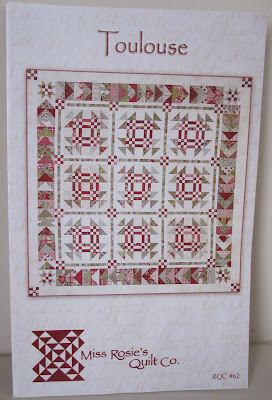 This is my next project, Toulouse, by Miss Rosie's Quilt Company. 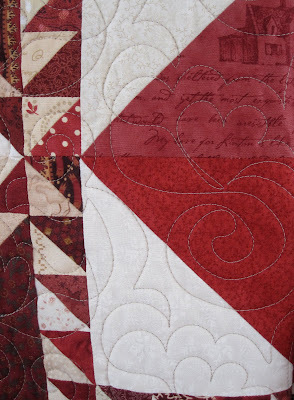 Nicole from Sisters Choice and Lisa the Stashmaster are also making this quilt. Nicole is going green and red scrappy with a white scrappy background and Lisa and I are going with Maison de Noel by Three Sisters for Moda, the fabric Carrie used for this pattern. Additionally, Lisa is going with a blue on cream background and I'm going with a red on cream background. (shocking I know, me and the red) This makes the quilts triplets, but not identical triplets. it's quilt #20, Father's Fancy. The blocks are the same size for both patterns, just the setting and borders differ. This is the fabric I'm using for the background. It should give it a different and more Christmas feel. Are you familiar with Maison de Noel by Three Sisters for Moda? It came out at least 3 years ago. 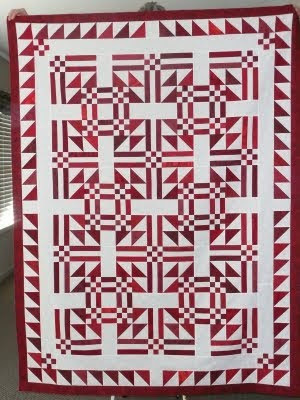 I was not familiar with it until I saw this pattern, but have since learned that it was a popular family when it was released and more so after Carrie published her Toulouse pattern. It's hard to come late to the party when it comes to fabric. This pattern is readily available, don't get attached to the fabric, it is not. For the first time in my quilting career I found a project that I wanted to make but could not easily find the fabric to get the job done. I asked one fellow quilter if she had any Maison de Noel she didn't want only to learn she was trying find some for herself. I ordered a pack of 5 fat quarters on ebay billed as Maison de Noel, only to receive the fabric and then find that only 2 of the 5 fabrics were Maison de Noel. I was able to order two of the greens and 3 of the blues from some online quilt shops. There's an online quilt shop in the UK that has some but refuses to mail fabric to the US! Another quilter had some, the background fabric, and is sending it my way. It's lovely fabric and easy to understand its appeal. Lisa had a fat quarter bundle of the family of fabric and offered to share her leftovers. I just got them! Thank You Lisa, I'm going to use each little scrap! When I looked through the fabric that Lisa sent (fondled is more like it) I thought the red on red looked familiar. Sure enough, here it is in my Father's Fancy quilt. And in my Myths of Avalon quilt! One 1 1/2 inch strip! But hey, that's just the size I needed for the 9 patches so I'll take it! 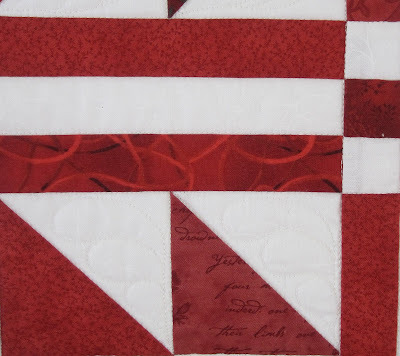 I really liked that red, little did I know that when I was throwing it in every quilt I was making that it was such valuable fabric. But here's the real lesson, keep those scraps! So even with Lisa's generous leftovers and the fabric I was able to beg, borrow, and buy on my own, I'm still going to need to supplement some other fabrics. I'm eager to see how it all comes together and having to work so hard to get the fabric makes me appreciate every little strip all the more. It will be just wonderful! I always like to add pieces from other groups...makes it so interesting. You'll have a true scrappy. And the whole using what you can scrounge experience of our foremothers lol! wow! Yes I already kick myself over some of those scraps that I threw away years ago! Gorgeous stuff! Thelma, I wish I'd had some of the fabric family you were looking for to send you , but I wasn't quilting 3 three year ago. My sewing machine was in storage and I was still raising grandchildren. But I can't wait to see your finished 'Toulouse' project. I just know it will be beautiful. We have been out of town for a few days and I just dropped in to see what you had been working on. Vanilla Stars is wonderful and I can't remember if I told you how much I loved your "Little Bits and Pieces". So much fun and a perfect name. Your view of the snow is really lovely. We Have the same 12-14 inches of snow that we have had since before the Holidays because is has been to cold for it to melt, so it isn't nearly as pristine and beautiful as yours. Wonderful pictures, thanks for sharing all the photos with us. We got approx 2" of the stuff yesterday. It's just so cold! I enjoyed your photos from the recent posts. I collect Christmas In The City. Love your display there. You, liking red? No, not surprised in the least! Toulouse is going to be a fabulous quilt! Lisa has helped me out with fabric on more than one occasion as well. I have a tub of older Fig Tree scraps that I must do something with this spring! Your snow is beautiful! You should see ours :) and the roads are closed due to icing! If I had the collection of fabrics you needed I would send it to you too. 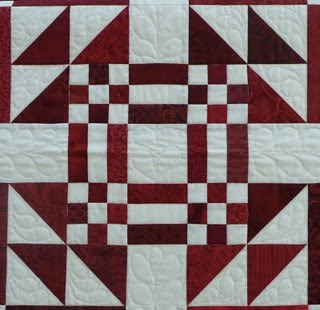 Your quilt will be lovely...love the Toulouse pattern. Stay warm. I stashed the background your using and have a bit of the big red floral on white. Email me if you need some ..i think I've got a couple yards. Beautiful snow scene view you have there! Your Toulouse quilt will be beautiful, I am sure. I went and checked my Christmas fabric (you know it's organized now...ha) but what I thought was Maison Noel was Christmas Past instead. Sorry. There are so many gorgeous fabrics out there you won't have a problem finding a suitable substitute. Can't wait to see how it progresses.